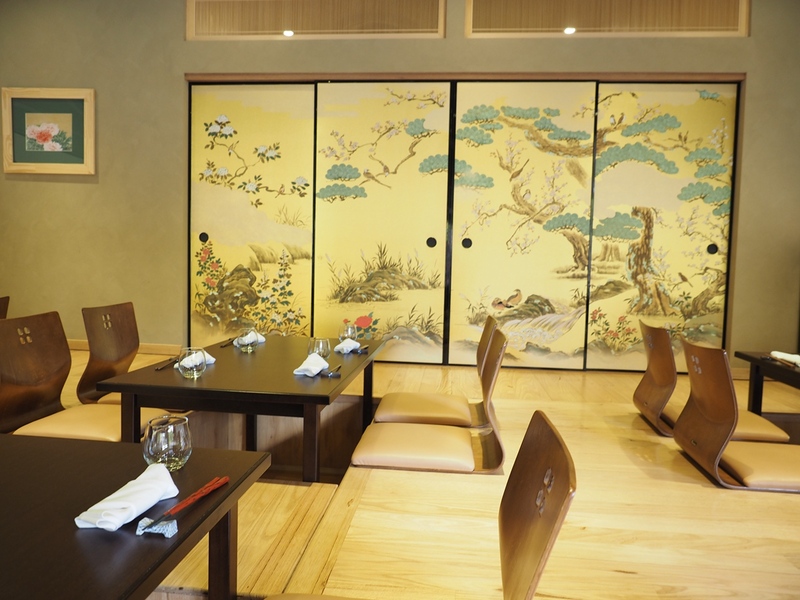 One of recent most preferred Japanese restaurant, Ginza Miyako in Stamford Plaza, has launched their Autumn menu. I’ve given a detailed introduction previously, so I will not waffle about things anymore but instead, I will go straight into food. After familiarizing South Australia for a period of time, the head chef Kazuki Ushiro has developed such an attractive menu which showcases the best and freshest Australian produce with his brilliant French cooking techniques and his rich culture background, Kobe Japan. 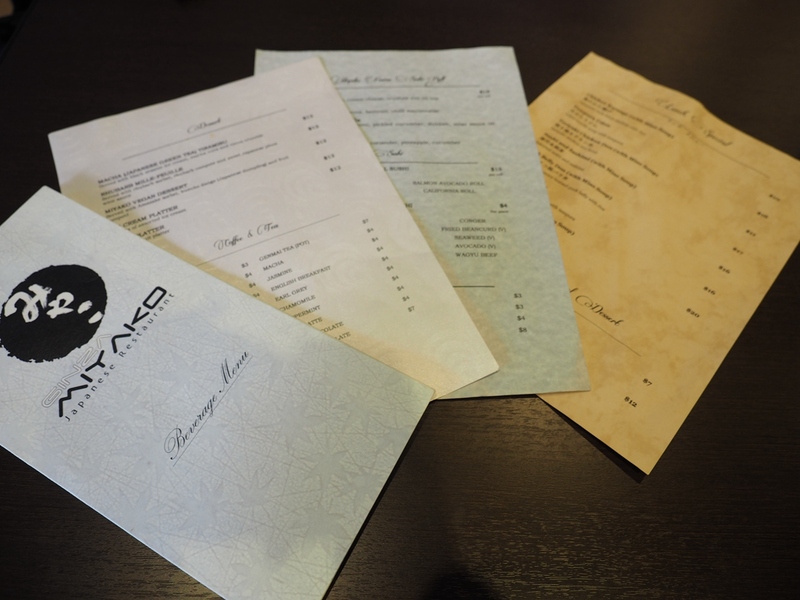 We were served with a 3-course meal from Ginza Miyako’s new menu with highlights from entrees, mains and the dessert. With the entrees, we had a platter of small dishes and four types of fusion sushi. 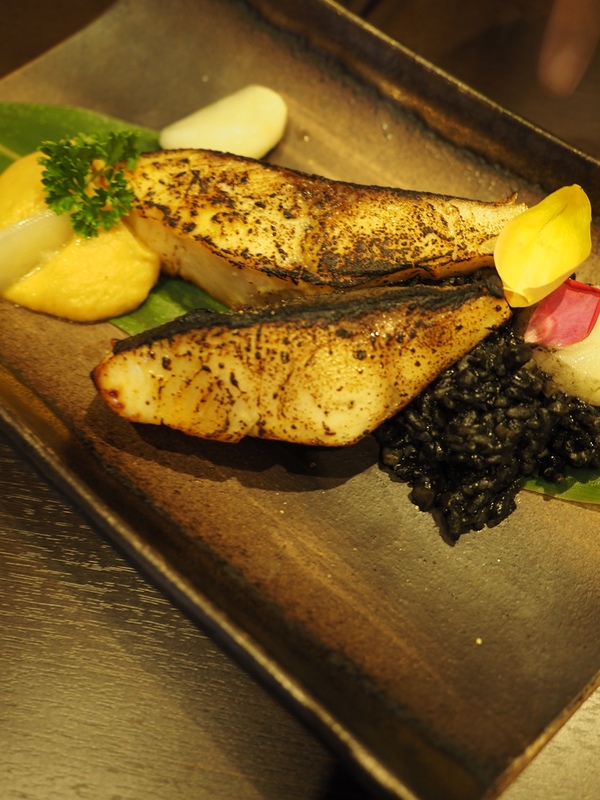 From the new menu, it is obvious that the chef has put more western elements in the traditional Japanese cooking, especially with being familiarized with some of the best produces in the state. Also from the new wine menu, diners can see Japanese sake, soju and even cocktails made with Japanese traditional liquor which will be exciting to try. If you look for wine-food pairing,the menu this season has been designed to pair with some of the good wines here in South Australia. Prices at Ginza Miyako is of the higher end but considering the amount of food and the quality of ingredients, they are very affordable. I strongly suggest to try to pair Japanese food with either wine or their traditional liquor. It will provide an invaluable experience. MIYAKO HORS D’OEUVRE PLATTER, $39. You probably have noticed the word Hors D’oeuvre. Yes, it is French so this is the first elemental change, name. 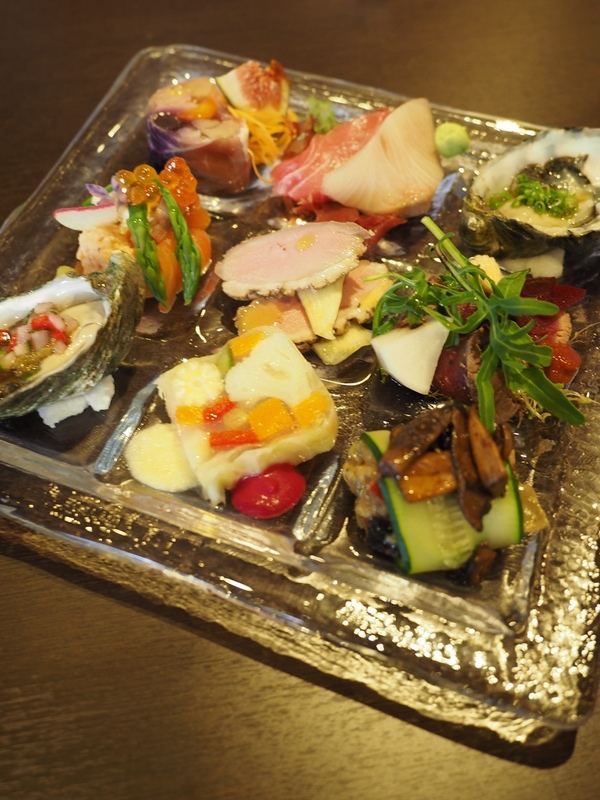 The platter was composed of 9 of the chef’s specially picked entrees. On the day that I was there, the nine entrees were (from top left down): rabbit terrine, smoked salmon, oyster yuzu chili, kingfish and tuna sashimi, duck ham and fennel pickles, vegetable terrine (vegan), oyster ponzu, venison tataki, vegetable tartare(vegan). From the above list, diners can definitely see the French influence at this restaurant. Dishes like terrine are well defined within the Western cooking, especially in European countries and it is implemented in Japanese cooking. How exciting! The fresh coffin bay oysters were paired with traditional Japanese sauces and is another good creation for fusion. Diners can easily experience the freshness of the oyster while tasting the flavours that have been added to the dish. I’ve enjoyed the venison a lot last time I was there so this dish needs no more introduction. It is simply good. What I liked the most in the dish was the duck ham with fennel pickles. This dish was brilliant in flavour and its simplicity has really attracted me. The duck was cooked to perfection while was still juicy and the fennel has added extra flavours with a hint of spiciness to complement the duck well. I would surely prefer to enjoy this in a hot summer/autum day with a soba maybe and a touch of soy sauce. Yummo! Wine suggestion: crisp sauvignon blanc from either Adelaide Hills or New Zealand. Assorted fusion sushi, $18 each roll. Roll Running with Bulls – Seared wagyu, wagyu sashimi, pickled cucumber, dukkah, miso sauce on top. This sushi is quite innovative. With the seared wagyu on its own, I am sure wagyu fanatics are going to wow for the dish. It is noticed that the chef has used the pickled cucumber (gherkin) which added this slight acidity and sweetness to the dish. The miso sauce and the dukkah combination on the top was a highlight as the Egyptian spice has really worked well with the Japanese sauce by adding the slight spiciness to the dish. Ibushi Roll – Smoked eel, pumpkin, cream cheese, crushed nut on top. The highlight of this sushi was the crushed nut which really enhanced the mouthfeel of the smoked eel. If you like cream cheese, you will also find a great combination in this dish too. Roll Diablo – Seared chilli marinated tuna, beetroot, chilli mayonnaise. Again, in this dish, the chilli mayonnaise and the Japanese seven spices are the highlight. Although one would expect tuna to be clean on the pallet, having chilli sauce did not let the flavour down. For beetroot lovers, the inside beetroot stick provide some juiciness and sweetness to the sushi. Roll Hanoi – Fish sauce marinated kingfish, coriander, pineapple, cucumber. 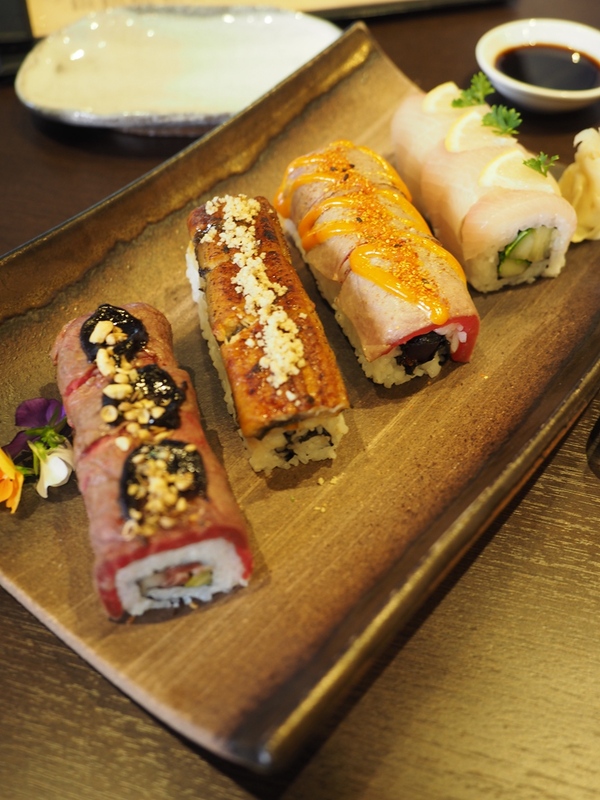 This dish is a perfect example of the combination of Japanese and Vietnamese cuisines. After being marinated in fish sauce, the kingfish has a slightly salty flavour but was still clean on the palate. The mouthfeel of the fish has been enhanced and the addition of lemon really added the required acidity to the dish. A preserved or cured lemon would work even better. Wine suggestion: Try to pair with Japanese sake or the cocktails below. The two cocktails shown in the photo above is quite exquisite. You don’t expect to have them in other places and I truly think the restaurant has done a great job using sake to replace the usual liquor. The one on the left is of a neutral flavour with some acidity while the one on the right is of a sweet tone. 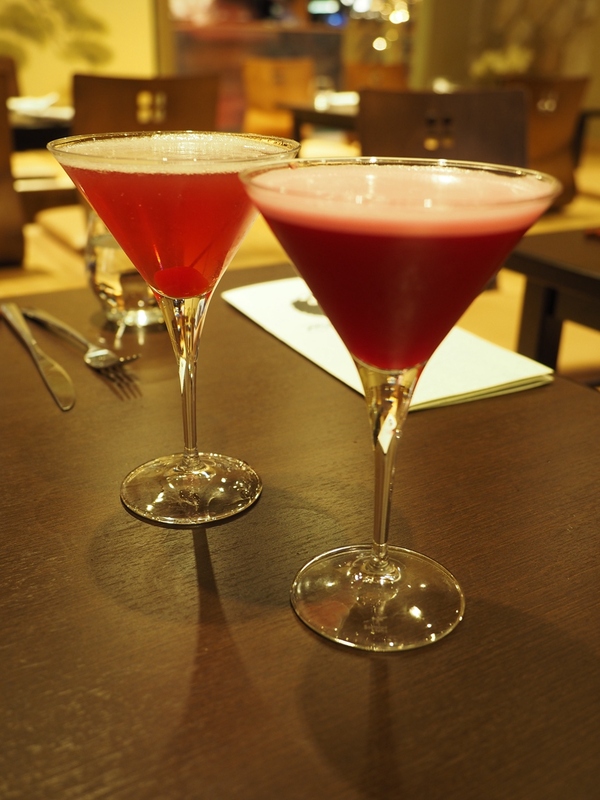 Both of the cocktails worked very well with the main dishes. The first main that came to our way for sharing is this fabulous kingfish dish. You won’t believe what you have tasted! The fish was marinated in miso and grilled to perfection with the flesh being so soft and easy to chew in the mouth. The fish was pretty fresh with plenty of good seafood flavours and the charred aroma on the nose. Did you see the black squid ink risotto? Partially correct! The risotto was one of the best I’ve ever tasted. The chef used a whole squid’s ink to cook this dish and combined in with some of the squid’s hooks. It was not only smelt grea, but also tasted brilliant while one can definitely enjoy the ink aroma with the fresh fish and can experience the levels of flavours and mouthfeel that kept coming your way! 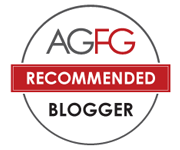 Well done and strongly recommended! Wine suggestion: Either a cool climate Chardonnay or the left cocktail above. The fruity flavours are going to lift the fish taste on your palate and give an exclusive experience. As I said earlier, Japanese cuisines are truly arts. Arts that you don’t even want to destroy. This dish is quite innovative too. The grade 7 She Wagyu beef scotch fillet on its own is already a delicacy but the chef has been intelligent enough to add other elemental features. One of them that was added was the edible soil which came from mushroom and it was combined with breadcrumbs and made the flavours really complementing each other. 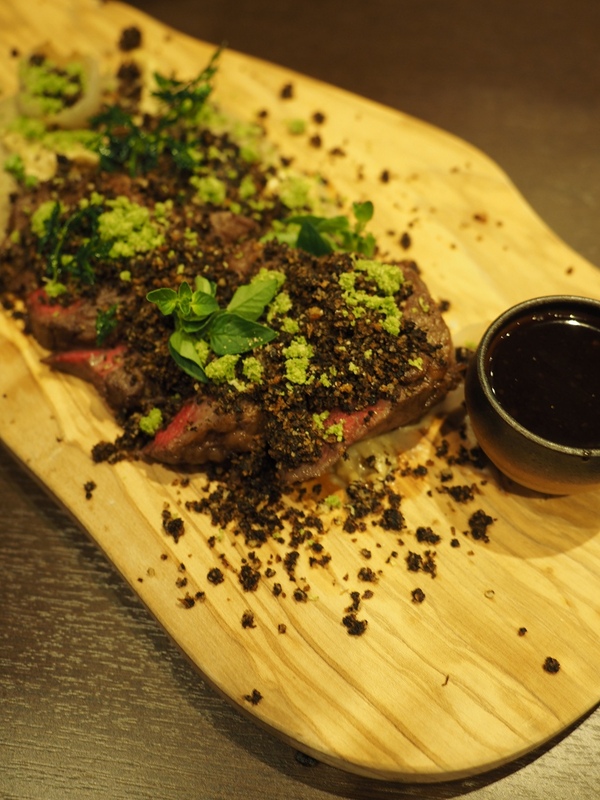 With the melt-in-your-mouth wagyu beef and the edible soil, layers of flavours kept jumping out. The most amazing thing in this dish was the oregano especially after tasting creamy mushroom flavours. Now, if you take a pinch of the spice and eat together with the beef, I guarantee you that your mind will be blown away! Simply so good! I was almost tearing after that bite, not because of the spiciness but the freshness and the great combination in flavour. Ushiro is a true master in playing with spices. This dish is a must must try signature dish! Btw, did you notice what the dish look like? – If you have been to Japan, you will know – Mountains, which are of a significant part in the spiritual world of Japanese culture. Wine suggestion: A spicy McLaren Vale Shiraz or a Coonawarra Cabernet Sauvignon. So, now, for all your sweet cravings! This dish was not actually super sweet but it had sweetness and bitterness from both worlds. 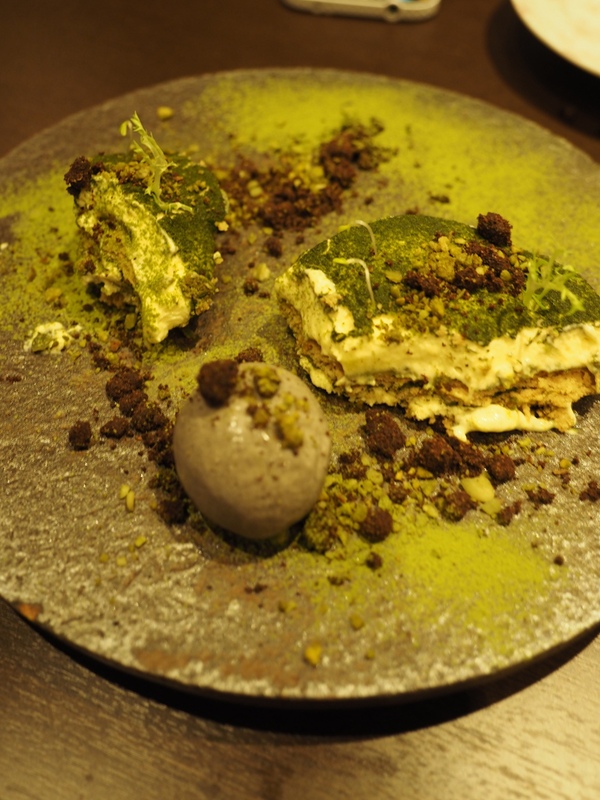 The green tea flavour promoted the tiramisu flavour while the black sesame ice cream flavour was used as a neutraliser and refresher to leave the tongue in an overall cleanness. The edible soils were made from chocolates too. The chef indicated that his philosophy in this dish was to introduce people to the fantastic flavours of Japanese macha (green tea) and to show how bitterness and aromatics can work well with Western flavours. Well done! Our food journey stopped here but our tastebuds were super active. I know they are going to have seasonal menus now so I am really looking forward to tasting future dishes with Chef Ushiro’s techniques. 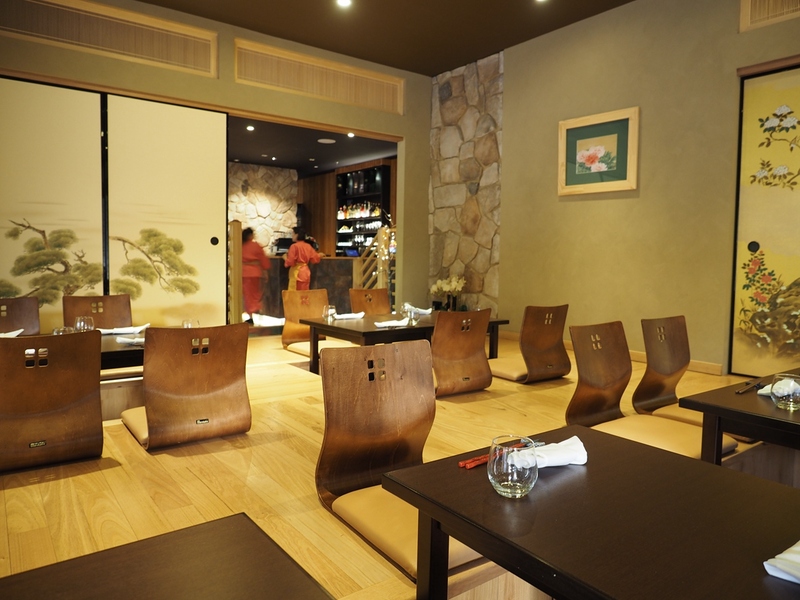 This is really a top notch high end Japanese restaurant in Adelaide. Truly a jewel! I tried them out on my last date after reading your article. They are very good and my partner got really satisfied! Yummo! I am jealous of you! 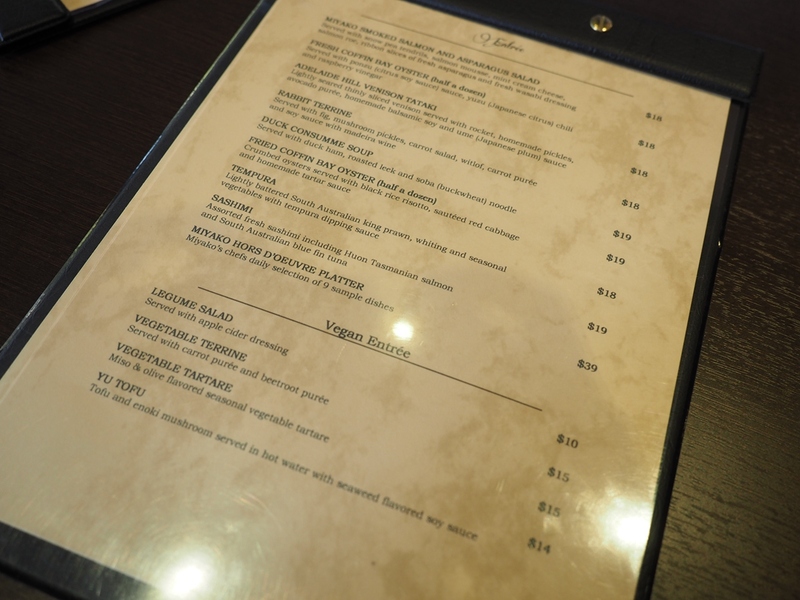 What a lovely and delicious menu! This is now on our schedule to try. Such a thorough review! We love fusion food and will soon try this place.